Mendel’s results, demonstrating that traits are inherited as dominant and recessive pairs, contradicted the view at that time that offspring exhibited a blend of their parents’ traits. However, the heterozygote phenotype occasionally does appear to be intermediate between the two parents. 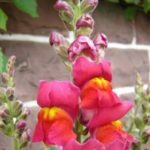 For example, in the snapdragon, Antirrhinum majus (Figure 12), a cross between a homozygous parent with white flowers (CWCW) and a homozygous parent with red flowers (CRCR) will produce offspring with pink flowers (CRCW). (Note that different genotypic abbreviations are used for Mendelian extensions to distinguish these patterns from simple dominance and recessiveness.) This pattern of inheritance is described as incomplete dominance, meaning that one of the alleles appears in the phenotype in the heterozygote, but not to the exclusion of the other, which can also be seen. The allele for red flowers is incompletely dominant over the allele for white flowers. However, the results of a heterozygote self-cross can still be predicted, just as with Mendelian dominant and recessive crosses. In this case, the genotypic ratio would be 1 CRCR:2 CRCW:1 CWCW, and the phenotypic ratio would be 1:2:1 for red:pink:white. The basis for the intermediate color in the heterozygote is simply that the pigment produced by the red allele (anthocyanin) is diluted in the heterozygote and therefore appears pink because of the white background of the flower petals. A variation on incomplete dominance is codominance, in which both alleles for the same characteristic are simultaneously expressed in the heterozygote. An example of codominance occurs in the ABO blood groups of humans. The A and B alleles are expressed in the form of A or B molecules present on the surface of red blood cells. Homozygotes (IAIA and IBIB) express either the A or the B phenotype, and heterozygotes (IAIB) express both phenotypes equally. The IAIB individual has blood type AB. In a selfcross between heterozygotes expressing a codominant trait, the three possible offspring genotypes are phenotypically distinct. 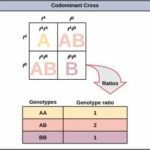 However, the 1:2:1 genotypic ratio characteristic of a Mendelian monohybrid cross still applies (Figure 13).